She was an impulsive, fashionable and carefree 1920s woman who embodied the essence of the Gatsby Girl — F. Scott Fitzgerald’s wife, Zelda. As Fitzgerald said, “I married the heroine of my stories.” All of the eight short stories contained in this collection were inspired by Zelda. 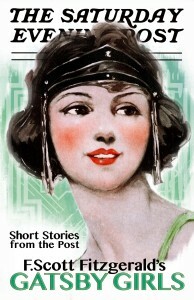 Fitzgerald, one of the foremost writers of American fiction, found early success as a short story writer for the most widely read magazine of the early 20th century — the Saturday Evening Post. Fitzgerald’s stories, first published by the Post between 1920 and 1922, brought the Jazz Age and the “flapper” to life and confirmed that America was changing faster than ever before. Women were bobbing their hair, drinking and flirting shamelessly, and Fitzgerald brought these exciting Gatsby Girls to life in the pages of the Post. A foreword by Jeff Nilsson, archivist for the Post, adds historical context to this wonderful, new collection, which is highlighted by an introduction written by Fitzgerald himself. Each story is accompanied by the original illustrations and the beautiful cover images from the Post. Read the stories that made F. Scott Fitzgerald one of the most beloved writers in America — and around the world — still today.